I have been wearing a lot of experimental combos on my toes lately. They are things that in my head work, but sometimes the execution leaves something to be desired. 🙂 So, in winter, when I only see them at home, I can decide how I feel about it. 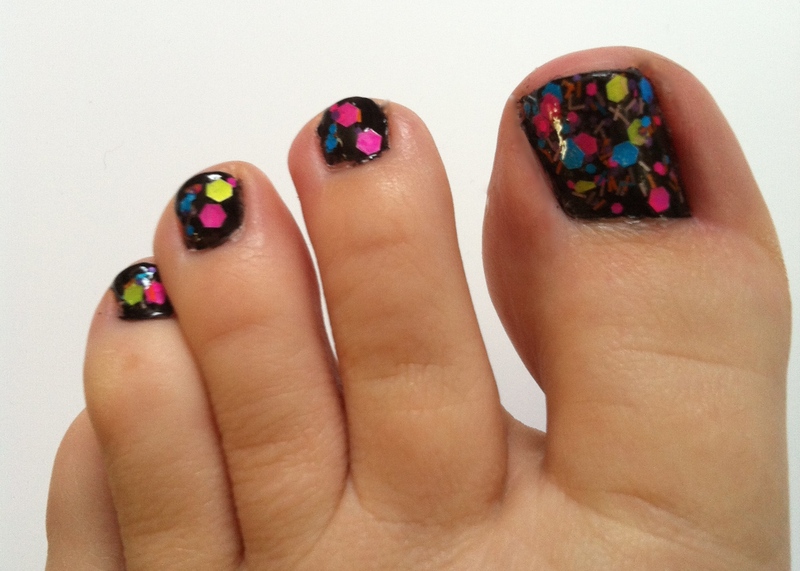 These are toes I think I would do again, and maybe even on my fingers. I used Sally Hansen Xtreme Wear Black Out for the main color. Then, the top splashes of color were provided by Funky Fingers Pep Rally. This is a polish with a mix of matte/pearl hex glitters in different sizes, as well as straight line pieces. There are all kinds of neon colors in the bottle. Overall, this was an easy polish to work with. There was minimal fishing for pieces and I was not trying for days to spread it around evenly. While I usually don’t sport a lot of dark colors in the summer, I do think this could be fun to reprise then. I think the neon would make up for the dark. P.S. There has a been a Five Below “coming soon” for months around me, but it finally looks like there might be merchandise coming in. I am super excited. I have a couple of Funky Fingers polishes from other people, but am looking forward to seeing what they have!